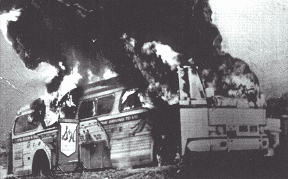 In 1961 an inter-racial group of young men and women (mostly college kids) calling themselves the Freedom Riders embarked on trips aboard interstate buses bound for the segregated Southern United States to challenge the non-enforcement of the Supreme Court ruling that segregated public buses were unconstitutional. Inspired by Dr. Martin Luther King's message of racial equality these young men and women put their lives on the line for that which they believed in, using non-violent means of civil disobedience as a way to bring about change. When Dr. King was asked to join the riders, he declined, stating that he did not want to violate his probation - a pretty lame excuse to say the least, but who can blame him? He was probably fearful for his life. King did give verbal support for the riders, but many of the participants in the movement became disillusioned and were disappointed in his refusal, for after all, as their leader they expected him to participate. Following their brutal treatment (arrests, mob beatings, fire bombings) during their rides and the escalating violence, the riders became front page news around the world. The treatment those young people received no doubt got Dr. King's attention, and subsequently he brought his influence to bear on the situation, expressing to then Attorney General, Robert Kennedy, that the situation was a source of deepest concern. Dr. King did, in the end, eventually violate his probation and also, in the end, put his own life on the line for the cause of freedom and justice.